UNICEF Ireland and An Taoiseach Leo Varadkar are offering you a chance to be leader for a day. If you’re between 13 and 18 and passionate about making a change in our society, enter our #KidsTakeOver competition. If you win you’ll take part in a #KidsTakeOver of the Taoiseach’s office on November 19th the day before World Children’s Day. CHALLENGE: If you were leader of the country, what change would you make to benefit children in your community, country or world? One young person will be chosen and invited to participate in a #KidsTakeOver of the Taoiseach’s office on the 19th of November 2018. The deadline for entries is November 7th. 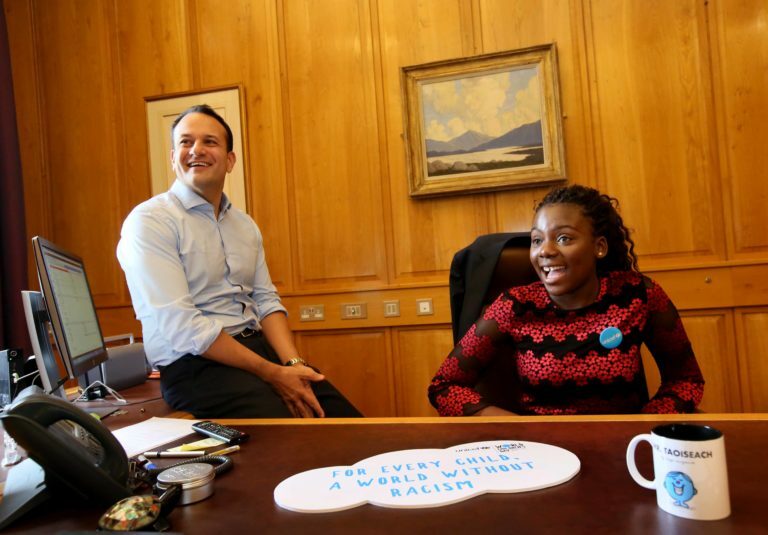 In 2017 Joella Dhlamini spent #WorldChildrensDay with Taoiseach Leo Varadkar highlighting her experience of racism in Ireland. This year it could be you advocating for the cause that matters most to you!